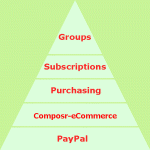 eCommerce support is tied to a payment gateway, such as PayPal. The system is highly extensible, where new dynamically handled and integrated products or services can be added by minimal coding by a programmer. It is the webmaster's responsibility to research any payment system before use, to convince themselves they are happy with the quality and terms of service. While Composr by default only supports particular payment gateways, this should not be considered an endorsement of any of those services. To accept payment in the modern world, an organisation must obviously have some kind of 'tie in' to the banking system. Composr, by default, allows payment via PayPal & WorldPay & SecPay & CCBill, although it could be extended to support any kind of payment gateway if extended and customised by an appropriate professional. PayPal is fully supported; WorldPay and SecPay are not regularly tested. PayPal was chosen because it is without doubt the leading form of payment on the Internet, easy to setup, and flexible in that it can provide support for funding direct from bank accounts, or cheque, as well as debit and credit card processing. Lots of people do not like PayPal policies, but we have no official position on this – development priorities simply follow funding. WorldPay and SecPay are popular alternatives to PayPal. There are many other alternatives that Composr doesn't currently support, but could. To accept website payments via credit card, or to take subscriptions, you will need a Business Account. The business accounts are free, but the fees are higher. You will need to have SSL set up for your site, as PayPal requires IPN messages to go via SSL from Sep 30, 2016, and we have already imposed this in our default code. You must not lock down PayPal to only accept encrypted forms. To configure the payment gateway settings go to Admin Zone > Setup > Configuration > eCommerce options. Your PayPal e-mail address (for the testing mode one, it's your sandbox PayPal e-mail address). Documentation for other Payment gateways is provided in notes at the top of the sources/hooks/systems/ecommerce_via/<gateway>.php file. Payment systems tend to be a bit complex and ones other than PayPal are best set up by programmers who know the particular ways messages and security works between your site and the gateway. All supported payment gateways provide a test mode, which is turned on from the Admin Zone Configuration. Test mode allows you to make purchases from your website using the full eCommerce architecture of Composr and the payment gateway, except no money will actually be charged (it's a simulation mode) – the ideal way to test your setup without risking real money. For PayPal test mode goes through the PayPal sandbox. Sign up on the sandbox (this is your test account for making the sale), log in, and create a test user (this is your test account for purchasing). Be advised that we have found the PayPal sandbox to be buggy. If your tests fail with errors like "The link you have used to enter the PayPal system is invalid. Please review the link and try again." then you may be experiencing bugs in the PayPal sandbox. By all means, please complain to PayPal about it – we have run tests and found the sandbox fails midway through purchases on configurations that work correctly for live payments. 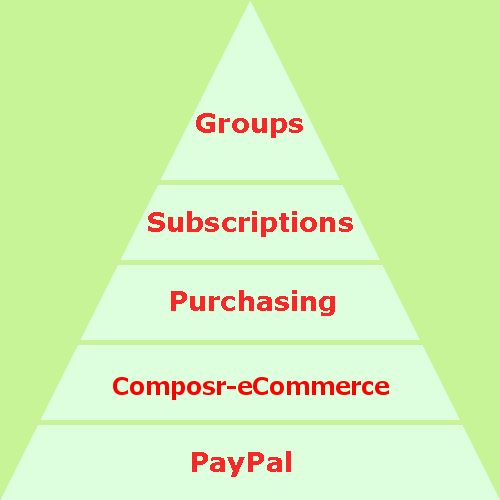 Composr has an abstract system of 'products' that may be 'purchased'. These Composr products are not the same as products that are available from shopping-cart systems, but rather, special types of purchasable product or service that have their own code to handle their purchase. usergroup subscription: you may configure as many usergroup subscriptions as you wish, and these are all handled by the 'Usergroup' product kind. Each configured subscription is considered a 'product' for sale on your site. Various kinds of non-purchasable product that exist for accounting purpose – interest, tax, wage and other. These aren't for sale on your site but positive or negative transaction sums can be entered against them in the Admin Zone, so your profit/loss and cash-flow charts can be accurate. In the code these are defined via a PRODUCT_* constant from the ecommerce code file. While the abstraction of this may be confusing, it is very beneficial as all kinds of automatically handled products may be programmed to integrate with Composr functionality. a product that sends out an e-mail to a dispatch warehouse instructing them to mail out a copy of a bands latest album to the address specified in the member profile of the purchaser. Most useful kinds of purchase can, however, be achieved with the default usergroup product: a usergroup for which membership can be bought could be given additional permissions that reflect access to features or areas of the website that would not otherwise be available. This is how most websites will use the eCommerce system because it is simple, effective, works well with PayPal, and does not require programmers to implement. Any transaction that goes through is matched to a product that will then verify the payment and dispatch the sale. The product is matched via the product name – i.e. the product name in the transaction matches the name of a product for sale. The product will usually see if the amount is correct for that product, and it will use the ID to find how to dispatch the sale. For example, on our old site (when Composr was commercial software) the 'lifetime registration' product stores the site-ID in this, and thus when the transaction went through it knew what site has been registered and could go and then send out the key etc. The 'product name' would be USERGROUP<id>. You can see how we have created a separate product for each different kind of usergroup subscription. The 'product ID' is actually specified via the set_needed_fields function for most product hooks. In the case of usergroup subscriptions there is no set_needed_fields method because the ID of a row in the subscriptions table will be used in this case (subscriptions are a little different). i.e. it provides the information needed to link the purchased product back to a member's actual subscription record. Actually, the 'product ID' is always a string, so it has gone through the PHP strval function, and gets converted back via the PHP intval function. You will see we essentially have two kinds of ID here. There's an ID embedded into the product name, and the 'product ID'. Typically we generate different product names when the prices will be different in each case, while the 'product ID' typically is either the purchaser's member ID or is the ID of another table that defines the specifics about the member's customised purchase. So in this case the different configured usergroup subscriptions in Composr have different prices, so are different products – but the ID of the actual purchased subscription is not price-determining. It is possible you won't have both – for example, the 'product name' may fully distinguish the purchase – in this case you probably should just use the purchaser's member ID as the 'product ID'. Custom product hooks that are selling many individually priced items related to a specific user will often have a get_products function that lists a large number of items. There is a mechanism for get_products to only list products matching a specific 'product name' / product title, for performance reasons. If you have 1000s of products (or more) and are linking to purchase from custom code then you should return no products unless a filter is requested, and then use that filter to determine what products to show. User goes to the purchase module in Composr, and selects a product. Alternatively some custom code or link may bypass this step and direct them deep into the purchase module, i.e. to a known product. Product message is shown, if the hook defines a get_message method. Product agreement is shown that the user must agree to, if the hook defines a get_agreement method. User details what 'product ID' they are purchasing. 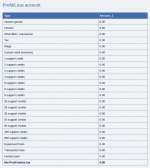 This happens by them filling out a form determined by the product hook's get_needed_fields method. Actually for manual transactions in the Admin Zone there may be a get_identifier_manual_field_inputter method too, because admin's typically need more control when putting through a manual purchase. get_needed_fields does not have to be defined in a hook, so this step is optional too. 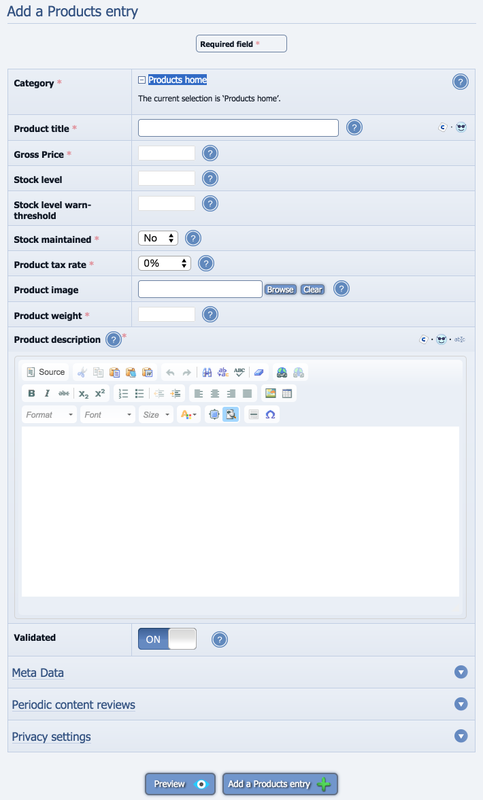 A 'product ID' is generated via the hooks set_needed_fields method. If there was a get_needed_fields method then this typically works by taking the form input from the previous step and saving it, and getting an ID. However sometimes hooks may just generate an ID via some other known mechanism, or will just return the purchaser's member ID. It very much depends on the necessary purchasing process for the particular kind of product. An availability check is performed, if the hook defines a is_available function. This can do things such as stock checks, sanity checks, and permission checks. It returns one of a number of possible ECOMMERCE_PRODUCT_* values, ECOMMERCE_PRODUCT_AVAILABLE if purchase may happen. An IPN (i.e. background message) is sent back to Composr when the payment has happened, and/or when the user clicks to return back to Composr. Composr interprets the IPN to get back the 'product name' and 'purchase ID'. This is very hook-dependent. For PayPal it will look at the human item-name, find the matching 'product name' (i.e. codename), and it will already know the 'product ID'. For WorldPay and possibly other payment gateways it will have to look up a specific transaction in the trans_expecting table that Composr used to track the purchase, because WorldPay doesn't route through full information as PayPal does. Composr looks in all the product hooks to find a matching defined product, checks the price, then dispatches a call to the specified handler function for that product (e.g. handle_usergroup_subscription). The handler function then does what is necessary to make the purchase happen. For a usergroup subscription this means putting the purchasing member into the appropriate usergroup. 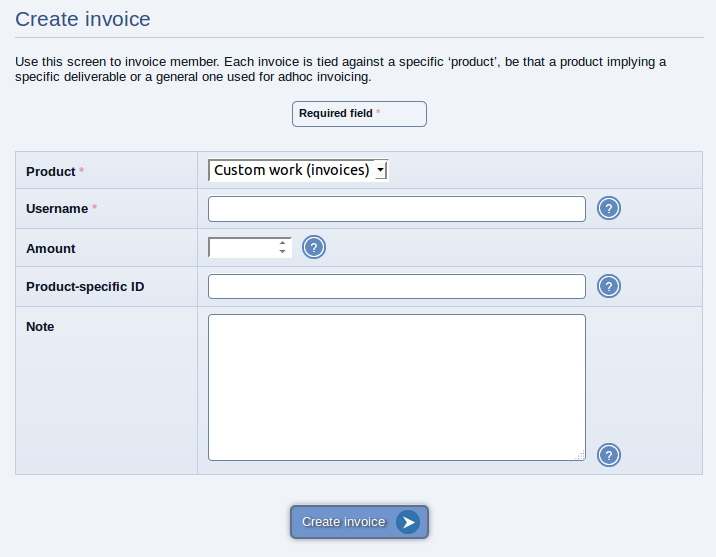 Subscriptions and invoices have some custom handling. Subscriptions can also end, so they are separately tracked with life-time details, and there are cancellation signals that are also fed through. Each separate invoice is not given a separate product even though each has a separate price, as it would get potentially too out-of-hand, so the handling of invoice price checking is hard-coded. Invoice products could actually be taken advantage of for this – you could generate custom invoices for particular purchasable items, if very large quantities of potentially differently-priced items are involved. Normally a transaction would go through via PayPal/etc. i.e. Composr sends a user off to PayPal, and then PayPal calls back saying the transaction has happened. 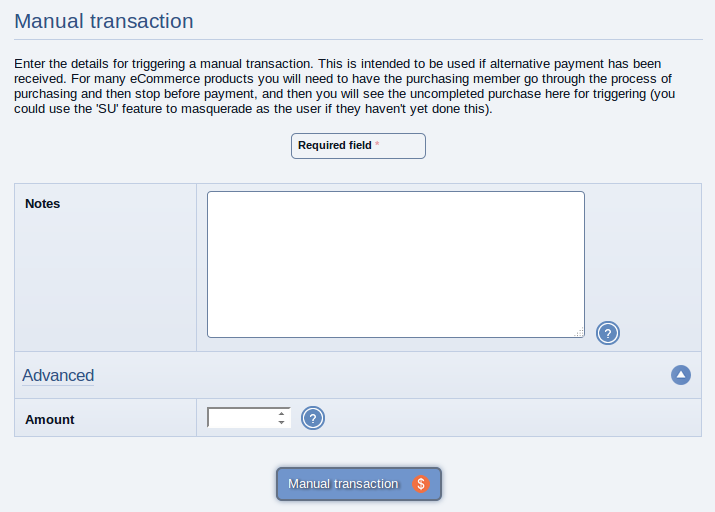 access the manual transaction screen (Admin Zone > Audit > eCommerce > Manual transaction). enter the sale amount that the product expects to be receiving (which you can leave blank for it to work this out itself). A link to the payment gateway to purchase. The description of the usergroup subscription is shown. You'd normally put a more extensive description here, explaining why someone should upgrade. Link to upgrade via a usergroup subscription. Usergroup subscriptions are implemented on top of subscriptions. 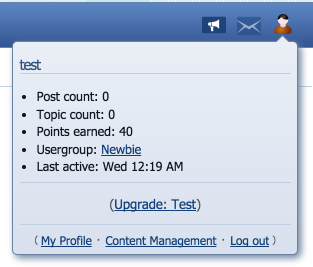 Usergroup subscriptions are only available if the forum system is Conversr . Add a usergroup that members will be able to subscribe to from Admin Zone > Security > Usergroups > Add usergroup. Make sure it is not 'Open membership', otherwise people could join it without paying. Assign additional access to this usergroup (or remove access from some of the other usergroups!). Fill in the form. Be aware that a '5' 'monthly' subscription means someone pays 'every 5 months'. It does not mean a subscription is paid every month and lasts for 5 months – subscriptions last indefinitely until the user chooses to cancel them. Provide a path for members to visit the purchase module so that they may activate their subscription, if one does not already exist (it does exist by default). By default this is possible via upgrade links shown in the logged-in box as per the above screenshot. 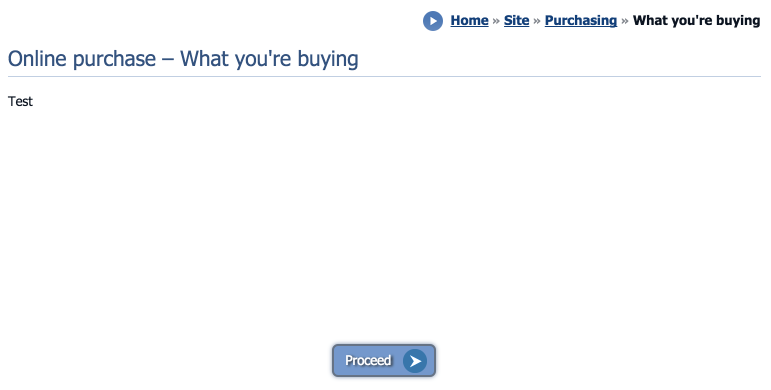 You do also this via the purchase module (site:purchase page-link, Content > Purchasing on the default menus). You can add as many usergroup subscriptions as you like, even multiple to the same usergroup. For example, [by adding more subscriptions] you could make it cheaper to subscribe yearly than monthly. You can delete a usergroup subscription from the bottom of its edit form. Members may be invoiced by the staff. To do this, go to the Admin Zone > Audit > eCommerce > Create invoice. Members may view their invoicing history via links in their member profiles. The Composr online store works via the existing Composr catalogues system. Out-of-the-box there is the shopping cart catalogue (called products). You can access this catalogue for modifications, and adding products to, from Content Management > Products. The Composr store has intentionally been kept lightweight. We're not trying to compete with the dedicated eCommerce systems on features, we're trying to provide something with fantastic Composr integration and extendibility that meets the majority of people's needs. This way we are able to compete by providing eCommerce as a part of the full Composr package, rather than a standalone eCommerce system that is bloated in its own way but lacking the features needed for a wider website. By default the catalogue is configured to allow product reviews, but you may turn these off if you wish. 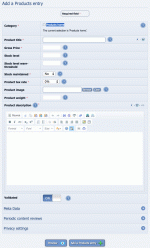 You may add additional fields, such as extra product images or specifications. However do not reorder the original fields (or delete, or change the field type), as the system uses the order of these fields internally to know what they refer to. If you wish to change how they are shown do it via template editing. A popular request is to be able to specify options when purchasing a product, such as size or colour. This would be a major task for us to implement, and complicate the system, so we are not currently planning to add it. Simply add the different product options as separate products. If you are using PayPal a template edit can be used to let the PayPal buy button carry through an option selection. 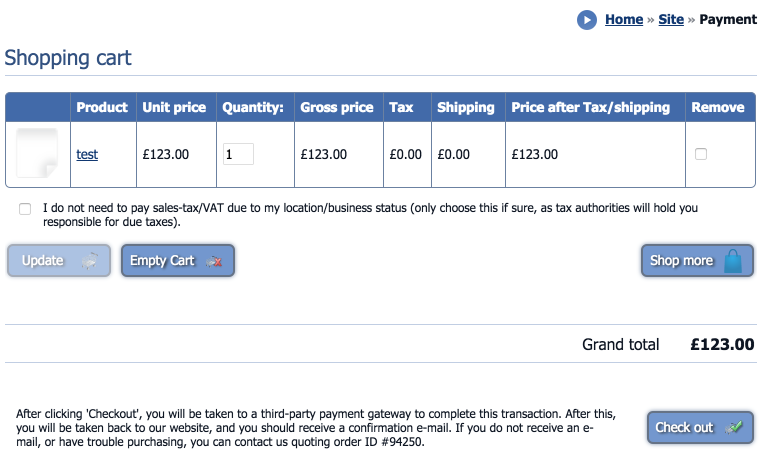 We have left an example in the ECOM_CART_BUTTON_VIA_PAYPAL.tpl template. This workaround shifts the configuration burden over to being a template editing task, and shifts the administration burden onto PayPal's end. If you need more flexibility than this (perhaps many different product options for different kinds of product), you should consider either sponsoring extended Composr development, or using a dedicated third-party eCommerce system. Once you are happy with your set of fields, you can add categories and entries to your catalogue. As this is exactly the same as adding entries to a normal catalogue, I'll refer you to the Custom structured content (via catalogues) tutorial. Be aware that once ordered, a catalogue entry shouldn't usually be deleted. You can unvalidate the entries instead (unselect 'Validated'), and/or move it into an archive category and/or set the stock to zero. This is vital to your ledger integrity. There is an option to forcibly purge an item from the database and all past order history for it, but it's not usually recommended. Once you have entries, and your eCommerce configuration is configured, users can start using your store from the products catalogue (Content > Products, on the default menus). From here they will be able to navigate to the shopping cart (site:shopping page-link, Content > Shopping cart on the default menus) and finalise and pay for their order. You may customise the appearance of the store in the usual way of editing catalogue templates (the products catalogue already has most of the templates overridden with eCommerce-tuned styles, so you do not need to worry about accidentally altering the look of non-eCommerce catalogues). Guests may make purchases, if they have the right Composr permissions (to the catalogues module, the products catalogue, and the shopping module). We can't tie the purchases to IP addresses because often thousands of users can be on the same IP address. If you think users may be making delayed purchases as guests, you may want to consider removing Guest permissions to the shopping module, to force logins. When orders are purchased, an e-mail is sent out to the staff so they can fulfil the order, and the stock level is adjusted. Tax and shipping calculations have intentionally been kept very simple, but programmers may extend them. We intentionally have architected the calculations to go through some simple common functions that you can override to addon additional behaviour if you need to. Some custom profile fields are preinstalled to allow members to set their shipping address in their regular profile settings (instead of having to define it each time when they pay on the payment gateway). However by default these fields are not enabled, so you would need to edit them to enable 'Owner viewable' and 'Owner settable' for each field. The currency the website works in is defined in the configuration. If you use PayPal you need to make sure your account can accept this currency and is not set up to allow people to choose which currency to pay in (as it stops Composr being able to verify the payment if they use this feature). 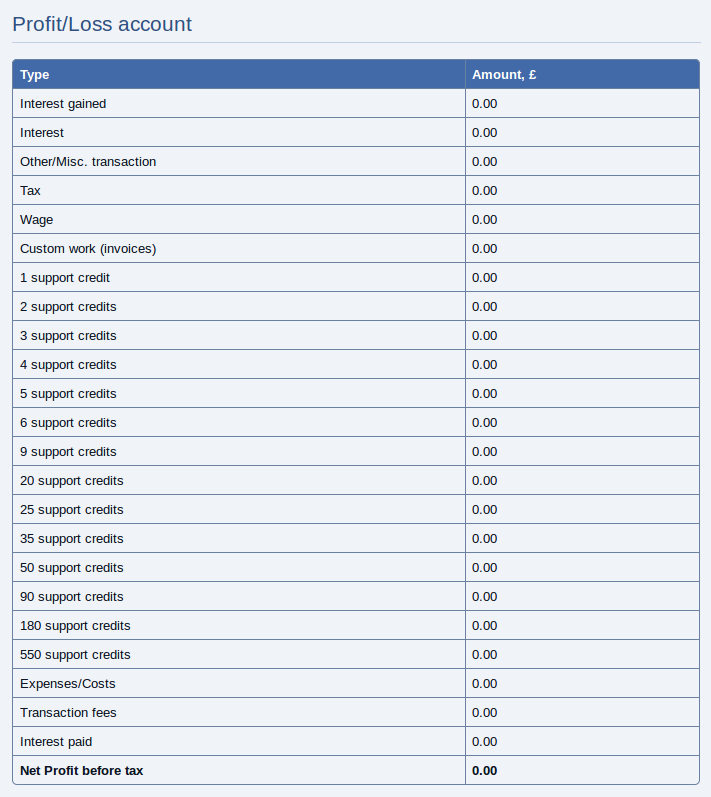 Composr includes some basic accountancy charting support. This is not intended as a replacement for a proper accountancy system, but does serve as a very useful overview of finances and a record of activity. The developers do not accept any responsibility for the financial accounts of users of the Composr eCommerce system. Accountancy features are provided as an aid only and are not guaranteed to perform to match any legislative, tax, or accountancy conventions. Composr supports manual transactions to be entered. This is possible in the Admin Zone module. Entering a manual transaction will trigger any code associated with the purchase of a product (such as a usergroup promotion). Manual transactions may also be used to input transactions that are totally external to Composr, and thus otherwise immeasurable by the charting. For example, an organisations expenditure may be recorded by manually inputting a negative transaction for the special 'Other' product. A system, originally created by PayPal, for determining the progress of a financial transaction or ongoing subscription.